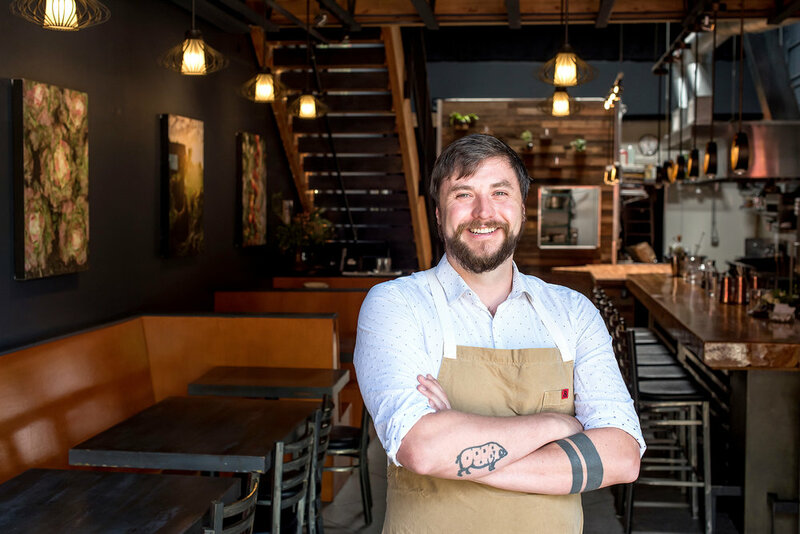 Quaintrelle serves Pacific Northwest inspired cuisine made with passion and intention. We work with a range of purveyors to ensure we are getting the best seasonally available local ingredients. You can find a list of some of our preferred vendors at the bottom of the page. Chris grew up in a small town just south of St. Louis, Missouri. After college, he moved to Chicago, Illinois and started working in restaurants. Like many before him; he started out washing dishes and parking cars. Parking cars during a Chicago winter was not fun. It didn’t take long before he was back waiting and quickly became a server. That is when he discovered that the more wine knowledge you have, the more wine you can sell. But wine quickly became more than a means to bigger tips, it became a passion. He took advantage of trade tastings, seminars and classes to further his wine knowledge. Then in 2004 things changed, Chris worked his first wine crush. That was it; the PNW was where he needed to be and in 2007 he moved to Portland. When he is not working you can find him on the golf course. He lives in SE Portland with his partner, Kathy, two dogs, Bansky and Turkey and a calico named Nibbler. Camille was raised in Eugene, Or where the exposure to gourmet food, conversation and local flavors were a quintessential part of her upbringing. After obtaining a degree in Sociology and moving back from Boulder, Co, she found herself along side certain renowned bartenders and sommeliers which exposed her to a Mecca of cocktails, wine and spirits. After spending some time traveling, she embraced her need to be along side those who celebrated their craft. With inspiration from other incredulous colleagues, she further developed her palette and indulged her creativity behind the bar. When she is not at Quaintrelle, you can find her spending time with family or taking trips to Bend with her English bulldog, Olivia Mae. Quaintrelle's ownership team is comprised of Emily Everett, Sandi Wilkens & Daniel Wilkens, who share a passion for food and wine and are committed to taking advantage of the bounty that the Northwest has to offer. The following is a list of some of the many folks we plan on supporting throughout the seasons . We are committed to using top quality ingredients from top quality people and purveyors. We try to keep it as local as possible, but will stretch our reach when we find purveyors that have quality that surpasses what we can find in our back yard.